One thing that lifts our hearts at Shared Earth is being able to help transform the lives of others. A great example of where we, and you, make a real difference is with Karm Marg. Karm Marg, based in Faridabad just outside New Delhi in India, is an amazing project set up over 20 years ago to rescue street children and provide them with a safe refuge in which to grow up. There are generally 60 children at the home at any one time, including six children with special needs. The children receive education in local schools. They also help out in the kitchen and learn new skills in the kitchen garden which produces much of the community’s food. Over 100 alumni return to Karm Marg to pass on their skills and experiences to others. Karm Marg also rescue abandoned dogs from the city. The children help to nurture these animals, forming new friendships and learning skills and empathy. Karm Marg provides employment for women from the surrounding villages. 200 women have been trained and 70 women are currently employed there. As well as buying products from Karm Marg, Shared Earth supports the community with charitable donations. This year we are contributing to a project that will bring solar PV and solar hot water to the community, improving the lives and the safety of the children. 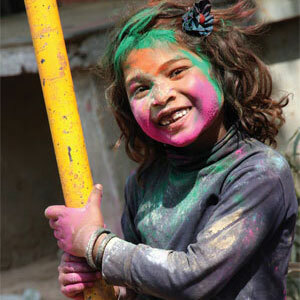 Karm Marg also organises and participates in programmes to raise awareness of children at risk. You will see various of our products using the product code letters JUG. This code stands for Jugaad, the commercial arm of Karm Marg. Jugaad is a Hindi word which means “making the most of whatever little is available to you”. The nerve centre of operations at Karm Marg, Jugaad helps the community generate income to support itself, providing vocational training for vulnerable young adults and women from surrounding villages. Profits from Jugaad support nearly 50% of Karm Marg’s activities. Together, the young adult trainees, alumni, and rural women create bags, wallets, jewellery, stationery and other eco-friendly products from discarded materials. They are ably assisted in this by the Karm Marg team, who help with the marketing and commercial aspects of Jugaad. Shared Earth has bought from Jugaad for many years. Thank you for the support you have given to Karm Marg over the years by buying their products from us. Together we make a real and tangible difference in the lives of others.